Hair loss is a common problem, but if it leads to baldness, you may have to resort to hair transplantation surgery for hair regrowth. Kaya Clinic hair transplant service can be your best choice for this. This is also referred to as male pattern baldness and is an inherited trait. In this condition, a form of testosterone called Dihydrotesterone or DHT latches on to hair follicles and destroys them. However, hair at the sides and back of your head are immune to DHT. Hair transplantation works by taking hair grafts from the back and sides of your head. Hair follicles here are DHT resistant and even when transplanted to another place, they are not damaged by this hormone. At Kaya, hair transplantation surgery is done at a few select centers that are fully equipped to handle this procedure. Highly skilled and experienced hair transplant surgeons perform this surgery, and so you can be assured that you can expect good results. Kaya Skin Clinic uses the FUE transplant method. The two hugely popular hair transplant techniques are FUE Transplant and FUT Transplant. 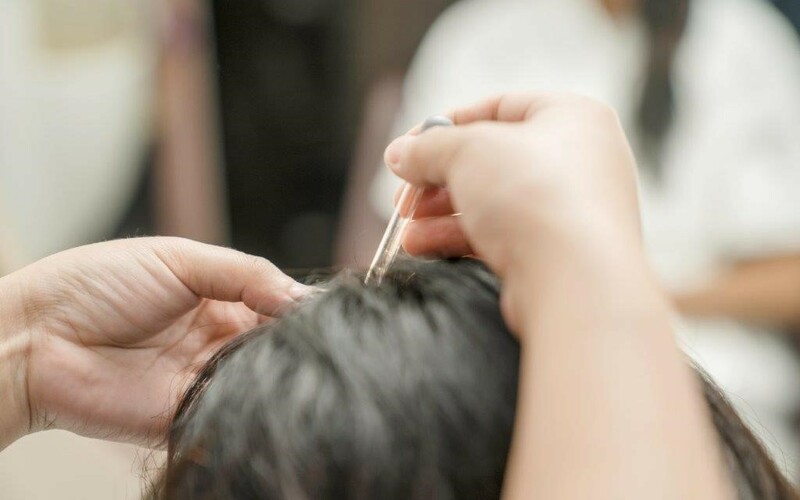 In Follicular Unit Transplant method, a long strip of hair is removed from a dense hair growth region at the back of your head. The surgeon then extracts good hair grafts from this to transplant to the bald region. In Follicular Unit Extraction method, single follicular units are extracted one by one, then these are sorted into groups. At Kaya HT Centers in Bandra in Mumbai, Green Parks in Delhi, or Indira Nagar in Bangalore, the hair transplant surgery is performed by highly skilled hair transplant specialists, who have many years of experience. The support team is also composed of highly trained and experienced technicians and nurses. Why is the experience and skill of the hair transplant surgeon so important? Besides the fact that surgery requires great expertise, hair transplantation is a special field with special requirements. The surgeons, besides being medical professionals, should also be creative and have good artistic skills. Also, in Follicular Unit Extraction for Hair Transplant, the surgeon should exercise special care to extract follicular units from within the DHT resistant area and not go over the border. Normally, your hair loss region would previously have had tens of thousands of hair follicles. But a hair transplant surgery can only harvest a few thousand follicles from your back or sides. To provide adequate cover with such a small amount of hair, the surgeon should be able to judge how many grafts he can get from your donor site, and plan how to place them on the recipient site so that they provide the best cover when they grow. Also, when the hair starts to grow back, they should look very natural, matching the hair growth style on the rest of of your scalp. All this needs imagination, visualization and good planning. The best hair transplant surgeons are able to accomplish all this- they map out hair transplant patterns well ahead of the surgery to suit your needs. Kaya’s hair transplant surgeons are proven experts in both the surgical and the creative planning aspects. They examine your scalp and understand your hair growth style. A folliscopy helps them determine how much hair can be harvested from the back or sides of your scalp. All these help them plan out your eventual hair coverage on the hair loss region. You are then given a clear picture of the total number of grafts that you can get, how many sessions it will require, and how much coverage you can get. The surgeon then begins planning the precise placement of the grafts in a specific pattern across the recipient region, to provide maximum coverage possible, and to make it look extremely natural. Kaya Hair transplant in Mumbai, Delhi, or Bangalore are all uniformly performed to the highest standards in a safe and hygienic facility, furnished with the best up-to-date equipments. Kaya’s systemic approach follows up hair transplant with good fortifying therapies like PRP treatment and Nutri Infusion therapy. So, you get the best results when you elect to have your hair transplant procedure at one of Kaya’s HT centers. You will be given post hair transplant scalp care instructions that you need to follow closely. Though the transplanted hair falls out within a month, the follicles begin to put out new hair in 3 to 5 months, and a few months after that, the transplanted hair will begin to grow normally, covering your hair loss effectively. You are then welcome to post a Kaya hair transplantation review on a customer opinion website. If you are worried about Kaya hair transplant cost, Kaya will let you pay per session, or provide a financing plan that will let you pay the total cost in monthly instalments.